CRISPR/Cas9 is a simple and efficient genome editing tool. Although gene knockout cell lines can be generated by gRNAs without donor vector, the screening process can be very tedious. OriGene offers genome-wide CRISPR gene knockout / knockin kits containing 2 gRNA vectors and donor DNA. The selection marker in the donor cassette greatly facilitates the screening process. 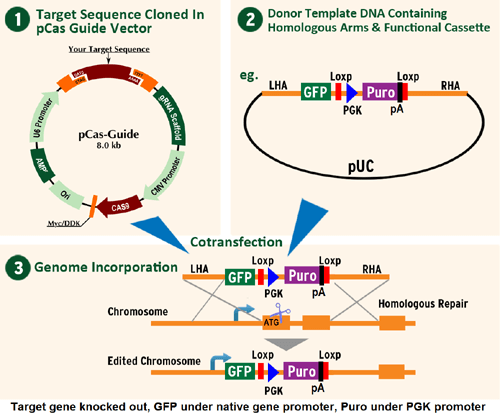 Two types of CRISPR knockout kits are offered, differing in repair mechanism that is used to achieve gene knockout, homology based or non-homology based. HDR-mediated knockout kit is our first generation gene knockout kits, gene knockout is achieved via homology directed repair (HDR). KN2.0 gene knockout kit is an improved version, gene knockout is achieved via non-homology based repair. KN2.0 CRISPR knockout kit is more efficient and works in both dividing and non-dividing cells. Gene knockout is based on non-homology-mediated repair mechanism. 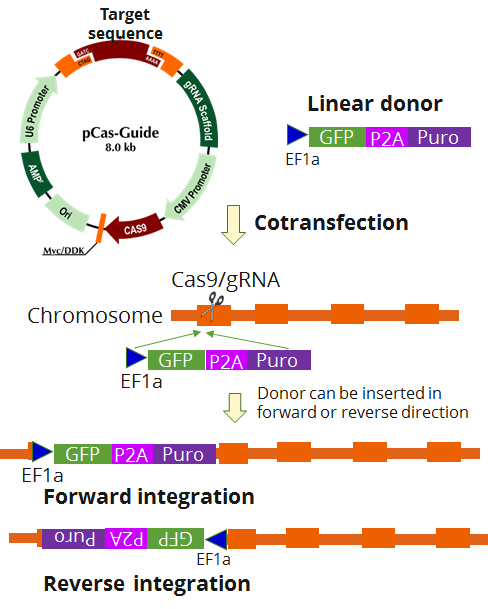 After gRNA targeted double stranded DNA cleavage, the linear donor DNA containing a selection cassette will be integrated at the gRNA cutting site at forward or reverse direction. Our testing data using KN2.0 kits showed that the vast majority gene knockout is bioallelic, one allele contains donor integration, the other allele has indels (insertion and deletion), which might change protein coding or cause premature stop. Gene knockout is achieved via homology-directed repair (HDR) mechanism. Donor vector contains homologous sequences flanking the selection cassette. After gRNA targeted double stranded break, donor cassette is inserted in the genome via homologous repair immediately downstream the native promoter.